The Amandus church in Bad Urach is an outstanding memorial to the Gothic architecture of our country. The significant choir room demanded an organ co-ordinated with the architecture of the room. As to the sound it should mirror the expectations of a properly styled instrument. Hence, its appearance has to be viewed as a result of many considerations which occur simultaneously. It is a synthesis of space, music and technical demands. 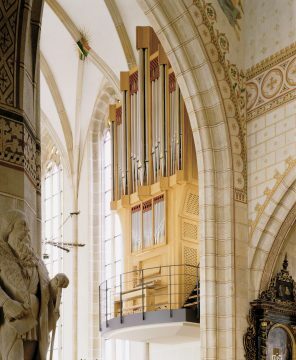 The base of this „swallow’s nest“ organ is rather slender and accommodates the keydesk and the action parts. It also carries the Brustwerk and the Great which is located on the top. The vertical towers (steeples) are about seven and a half metres high, measured from the floor of the balcony.